Home » Pre-Orders- Whats coming soon? British Carp record holder, taking it away from Wraysbury by catching Two Tone from Conningbrook, and thereby popularising overnight the new fake baits. Yateley, where he effectively established the carp stock on the complex that have since become historic in the annals of angling, including the infamous Tri-Lakes capture. Like the legacy he left at Yateley, there is also another one quietly flourishing down in Kent! Big fish but bigger laughs throughout his angling career, and the humour is illustrated by superb watercolour caricatures from Pete Curtis. Renowned raconteur who now has tales told about him by the contributors below, with many incredible fish and more records than you can throw a stick at! 100's of previously un-published pictures will be included in this book. 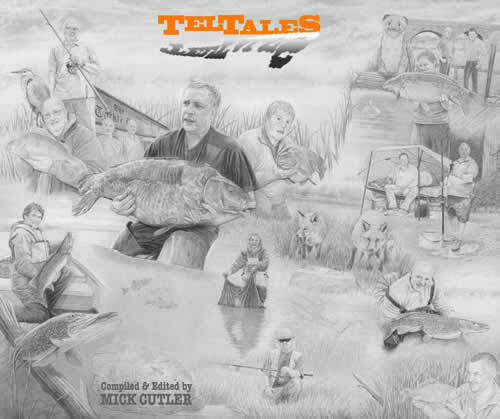 A stunning detailed artwork by John Grant for the dust jacket, featuring Terry with all the contributors in angling and wildlife scenes, will be placed on the website as soon as available. All Mick Cutler’s commission is going to the British Heart Foundation and a donation will be made to Angling Heritage (UK).